strong>Beirut, 14 February, 2012 --- A Bahraini Blogger and activist, Zainab Al-Khawaja (@angryarabia) -28 years old- was arrested on February 12, 2012, while marching peacefully towards the Pearl Roundabout in Manama. It is the second time in which she was arrested by the security forces in Bahrain during the last two months. Reports confirmed that Zainab Al-Khawaja has been questioned by the Public Prosecution Office and charged with "illegal gathering of more than five people". She will be kept in police custody for7 days pending investigation. The march to the now demolished Roundabout–symbol of freedom and center of the last year popular protests - was organized by Nabeel Rajab, head of Gulf centre for Human Rights (GCHR) and Bahrain Centre for Human Rights (BCHR), who walked along with his wife and two children, together with another two activists. As they approached the Pearl Roundabout they were shot at by the Riot Police with stunt grenade and tear gas. 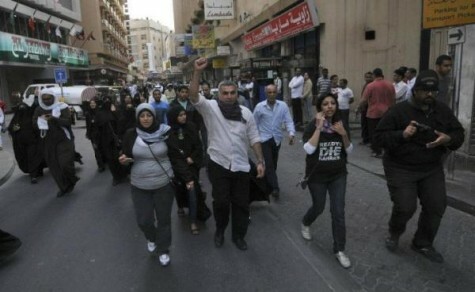 Al-Khawaja continued her way to the barbed wires surrounding the pearl roundabout where she was arrested. The arrest and 7 days detention of Al-Khawaja coincides with the intended demonstrations that will mark the first anniversary of the peaceful protests on Feb 14. Al-Khawaja is a prominent blogger on Twitter under the name (@AngryArabiya) with over 33,500 followers. She has been actively reporting on the current events in Bahrain, latest news on the protests and arrests, and in the mean time encouraging people to demand their human and civil rights. Al-Khawaja is already facing a trial on February 27 2012, facing charges of illegal gathering, assaulting a police officer and inciting hatred against the regime, after she was arrested during a protest on December 15, 2011, and detained for 5 days, where she was beaten and ill-treated. The GCHR and BCHR believe that the arrest of Activist Zainab Al-Khawaja is directly linked to both her work in the defence of human rights and democracy in Bahrain and online activities in reporting the news and events at a time in which the government pursues a policy of media blackout. We see this as part of an ongoing trend of harassment of human rights defenders in Bahrain. GCHR and BCHR are very concerned for the physical and psychological welfare of human rights defender Zainab Al-Khawaja. 2. Guarantee in all circumstances that all human rights defenders in Bahrain are able to carry out their legitimate human rights activities without fear of reprisals, and free of all restrictions including judicial harassment.